Pick-Up-Sticks is a game many of us played as kids. If you recall, a bundle of sticks roughly six inches long are held in a loose bunch and released on a table top, falling in random disarray. Each player then takes a turn removing a stick from the pile, with the goal of not moving or disturbing the remaining ones. Unfortunately, in many organizations, the use of strategy tools is eerily similar to Pick-up-Sticks. A series of random, unrelated strategic thinking tools are tossed onto the flip chart with no rationale as to their actual practical application or sequencing. People leave the session with a frustrated, unfulfilled sense of having done some thinking, but in a very unproductive, resultless way. Strategic thinking sessions shouldn’t resemble a game of Pick-up-Sticks, except of course for the competitive spirit and unbridled passion oozing from your pores. In assessing their organization’s strategy, more than 1,000 managers scored an average of only 8 out of 20, or 40%, when it comes to their company’s strategic capabilities. One of the biggest gaps found in the surveys is that less than 5% of organizations use more than two strategic thinking tools to develop new insights about their business as part of their strategy development process. 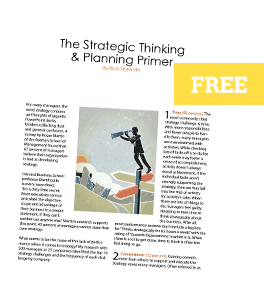 Strategic thinking can be framed by a methodical process of tools and frameworks that build on your thinking to reach c0nsensus on the strategic themes that should be driving your business. For most managers, working through tools like the Five Forces of Industry Competition is a waste of time since they at their level are most likely not changing what industry they’ll be in next year. A tool like SWOT Analysis often yields little practical application because people aren’t sure exactly what to do with the SWOT results once it’s completed. In fact, there are several logical exercises that should follow SWOT Analysis that lead you directly to the development of practical strategies for your business. Identifying the appropriate strategy tools out of the fifty available and then using them in the right order is crucial for successful strategy development. If your strategy workshops resemble a game of Pick-up-Sticks, will the game of Monopoly and bankruptcy be far behind?